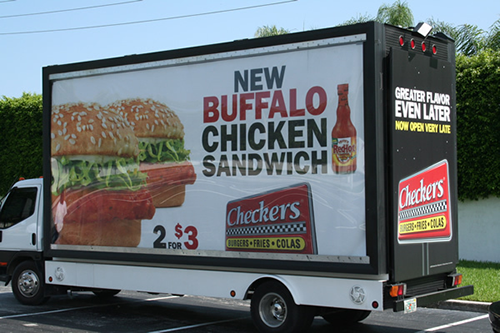 Mobile billboard trucks have posters mounted aerodynamically to the vehicle. They target consumers where they work, shop and spend time. They drive purposefully planned routes to reach the desired consumer. Mobility allows advertisers to strategically place their ads when and where it matters most. No other media format can offer the moveability of a custom route to consumers based on geography and demography. With the different types of mobile billboard trucks, you have the option to add a consumer interaction into your marketing campaign. These trucks can be used to distribute samples or special deals. Now let’s take a look at some mobile billboard truck options available to easily integrate into existing marketing campaigns! Static: These 10’ H x 22’ W on 30’ long trucks are traditional billboards on wheels. They deliver your advertisement closer to consumers and can be driven, moved or parked anywhere you choose to target as many people as possible! Digital LED: These lit up mobile billboard trucks turn heads! Digital LED billboards use backlight illumination to be seen at any time of the day. These billboards can also utilize video to entertain consumers and command the attention of pedestrians. Target people enjoying nightlife, concerts, sporting events or shopping centers after-dark. Digital LED mobile billboard trucks illuminate your outdoor marketing campaign! Custom Build Out: These mobile billboards have custom 3D elements or texture added to the truck. Add a basketball hoop, beer tap or any external element that makes sense with your brand. The possibilities are endless with a custom build out mobile billboard! Showroom: These mobile showrooms provide a platform to showcase products whenever and wherever. The truck has a glass wall, walk-in installment for people to experience a pop-up shop, product demonstrations, interactive game or other creative marketing ideas. These trucks bring your business and products directly to consumers! Beacon Enabled: As pedestrians come within 150 feet of the beacon-enabled mobile billboard, their smartphones will ping with campaign specific, hyper-targeted advertisements. They can activate a push notification containing directions to the nearest store, special offers, videos, games or whatever digital content works with your marketing campaign. When out-of-home advertising is paired with a smartphone campaign, the reach is amplified by up to 316%. Beacon technology enables mobile billboard trucks to provide measurable results and captivate your consumer! DRIVE sales and create brand awareness with mobile billboard trucks! Check out BillboardsIn to start your mobile marketing campaign!